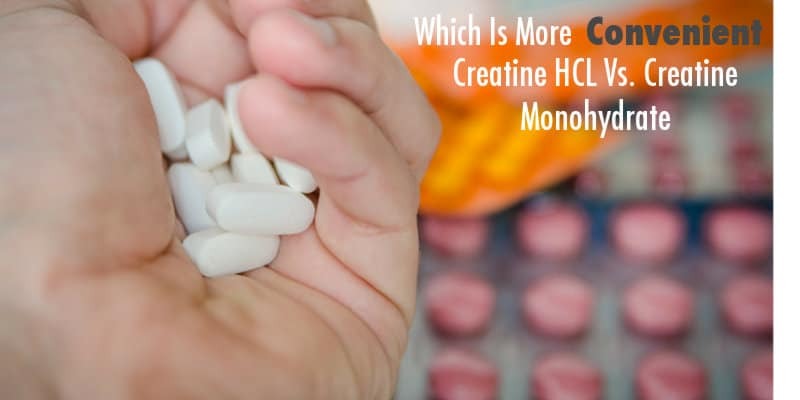 You are here: Home › Stayfitcentral Health & Fitness Blog › Health & Fitness Blog › Buyers Guides › Creatine HCL Vs. Creatine Monohydrate – Which Is Better? Since hitting the sports supplement market 20 years ago, creatine monohydrate supplements have become one of the most popular muscle building and performance enhancing products. Creatine is so popular that it’s used by men and women from all walks of life from weekend warriors to Crossfitters and professional athletes. My 68 year old mother even takes it every day to stay strong, healthy, and active. With this popularity comes a lot of competition. Over the years there have been lots of it, with several new and supposedly ‘better’ types of creatine hitting the market. They range from creatine in buffered and ester formulations to liquid based products. While they all claim to be better, studies show that none are superior to good old creatine monohydrate (1,2). A few years ago another type of creatine supplement hit the market, making the same claims of superiority as it predecessors. It’s called creatine HCL. Simply put it’s creatine bound to hydrochloric acid. Several companies use it with the most popular being Con Cret by Promera Sports. Companies selling it claim that it requires a much smaller dose to get the same benefits as you can from creatine monohydrate. Since this is such a bold claim, I did some research to find out whether this claim is true. I analyzed several criteria including the current research on both types of creatine, their cost, convenience, and safety to determine which is better. Keep reading to see what I learned and to learn for yourself if creatine HCL is the better choice. I searched PubMed and didn’t find any results for research on creatine HCL. I did however find a study conducted using it by researchers at Vanderbilt University. This study has not been published in a peer-reviewed journal which is the gold standard for scientific research. In this study, researchers mixed creatine HCL and creatine monohydrate in separate glasses of water. They then filtered the water to see which solution contained more undissolved creatine. 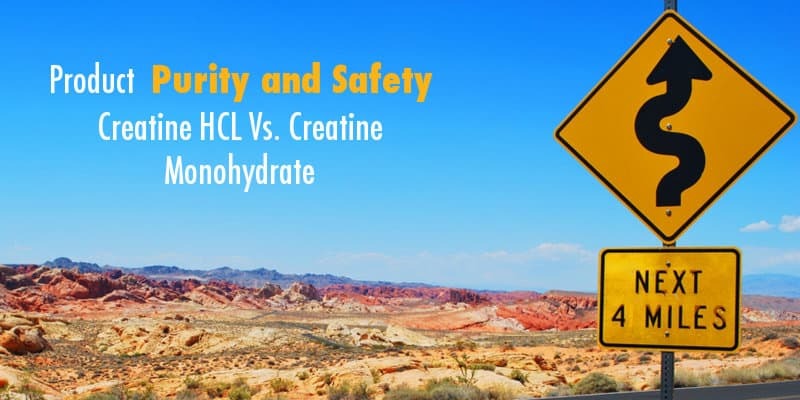 Results from this study shows that when compared to creatine monohydrate, more creatine HCL dissolves in water. This doesn’t mean too much since it doesn’t have to dissolved in water before consuming to be effective. If that was the case, other supplements like creatine monohydrate capsules and chews would be worthless. All it’s increased solubility means is that it may be a little easier to drink. 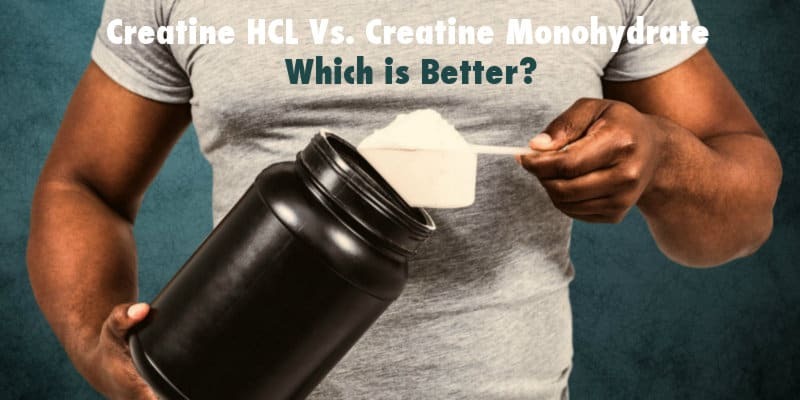 What we also don’t know is whether the creatine HCL converts to worthless byproducts after drinking or if it’s stored in your muscle cells in adequate amounts to produce results. These issues are more important than its ability to dissolve in water since creatine produces its benefits after being absorbed by your muscles, not in a glass of water. Unlike creatine HCL, there have been hundreds of published, peer-reviewed studies performed on the monohydrate form of this supplement. What they find is that creatine monohydrate doesn’t break down into useless waste products in your body and is able to be stored in your muscles in amounts appreciable enough to help you build muscle, get stronger, and workout harder (3). We also have dozens of studies which show that when taken properly (20 grams a day for 5 days followed by 5 grams a day thereafter), creatine monohydrate can safely help you build muscle, get stronger, and recover faster between sets of intense exercise like sprints or lifting weights (3). The cost per serving of Con Cret, the most popular creatine HCL supplement is $.68. Creatine monohydrate costs $.12 for every serving. While this is enough to show that creatine monohydrate is much, much less expensive there’s more. Even though you’re taking less per serving you will also use a can of creatine HCL faster than monohydrate. This is because it only has 48 serving per contains whereas a 2000 gram can of creatine monohydrate has 400. 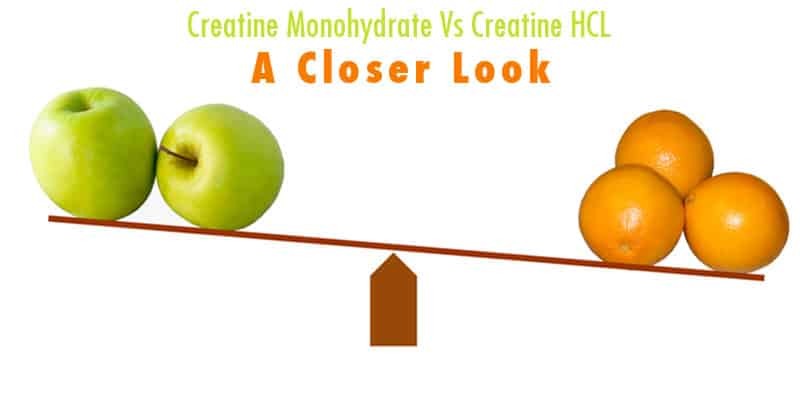 This difference means you will use several cans of creatine HCL before you’d even get through one of creatine monohydrate and as a result spend a lot more money. Determining a winner in this category is a little trickier. Promera Sports, which makes Con Cret, the leading creatine HCL supplement claims that you only need to take ¼ of a teaspoon daily. Creatine monohydrate supplements, on the other hand, require that you take about 20 grams (about 6 teaspoons) a day for 5-7 days and then 5 grams a day thereafter to keep your muscles full. At first glance, you may think that creatine HCL is the winner since such a smaller dose is required. Due to the fact we don’t have any research as to its effectiveness and that creatine monohydrate is known to work it’s makes the better choice, even though it may not be as convenient to take. The fact that it works makes it much more convenient since it’s a major hassle to learn you’re using a supplement that doesn’t produce results, not matter how much less you need to mix and drink every day. Which is more pure and safe? Several studies show that creatine monohydrate is safe to use as long as you’re healthy. This is true even when it’s take consistently for several years (4). No such research exists on creatine HCL. As you can see above, the clear winner in this battle is creatine monohydrate. 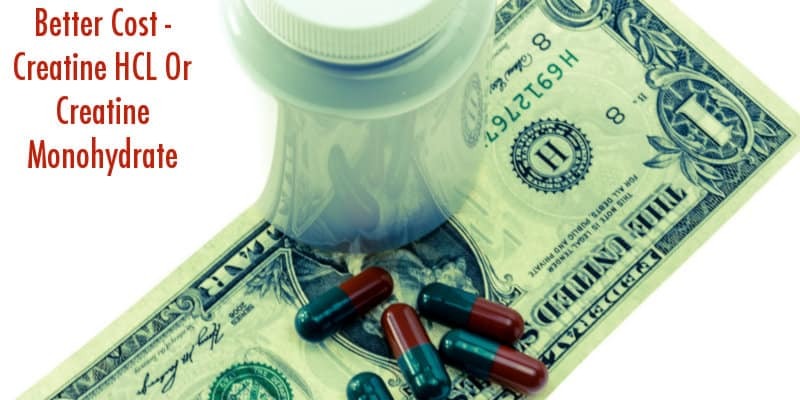 It’s benefits are supported by published research, is easy to take, costs way less, and is known to be safe. When you’re buying a creatine monohydrate supplement, it’s best to buy a product who tests and guarantees the purity of their product. They should make this clear on their label. I also recommend using a micronized creatine monohydrate supplement since it dissolves best in water which makes it easier to drink. A product that meets these criteria is Nutrakey Creatine Monohydrate. One can lasts several months and has a per serving cost of just 12 cents. I also recommend reading this article to help you get the most from whichever creatine monohydrate supplement you choose. 1. Jäger R, Harris RC, Purpura M, Francaux M.Comparison of new forms of creatine in raising plasma creatine levels. J Int Soc Sports Nutr. 2007 Nov 12;4:17. 2. Jagim AR, Oliver JM, Sanchez A, Galvan E, Fluckey J, Riechman S, Greenwood M, Kelly K, Meininger C, Rasmussen C, Kreider RB. A buffered form of creatine does not promote greater changes in muscle creatine content, body composition, or training adaptations than creatine monohydrate. J Int Soc Sports Nutr. 2012 Sep 13;9(1):43. doi: 10.1186/1550-2783-9-43. 3. Kreider, RB. Creatine, The Next Ergogenic Supplement? Sportsci.org. Accessed 2014 Feb. http://www.sportsci.org/traintech/creatine/rbk.html. 4. Kreider RB, Melton C, Rasmussen CJ, Greenwood M, Lancaster S, Cantler EC, Milnor P, Almada AL. Long-term creatine supplementation does not significantly affect clinical markers of health in athletes. Mol Cell Biochem. 2003 Feb;244(1-2):95-104. 5. Velema MS, de Ronde W. Elevated plasma creatinine due to creatine ethyl ester use. Neth J Med. 2011 Feb;69(2):79-81.